Nana and Afua may have grown up in the small German town of Wetter, but their parents ensured that they were exposed to their culture through various means. One small way, which had a lasting impact and captivating hold on the girls, was their father’s handmade leather Ohenema slippers. Coupled with their mother’s intricately woven Kente silk ensembles, and their frequent visits to Ghana, it’s evident why their roots would influence their design. In fact, it’s the one thing they were sure about when embarking on the idea at the end of 2012. Furthermore, they were whole-heartedly committed to ensuring that all production for the brand would take place in Ghana, or any other African country for that matter. 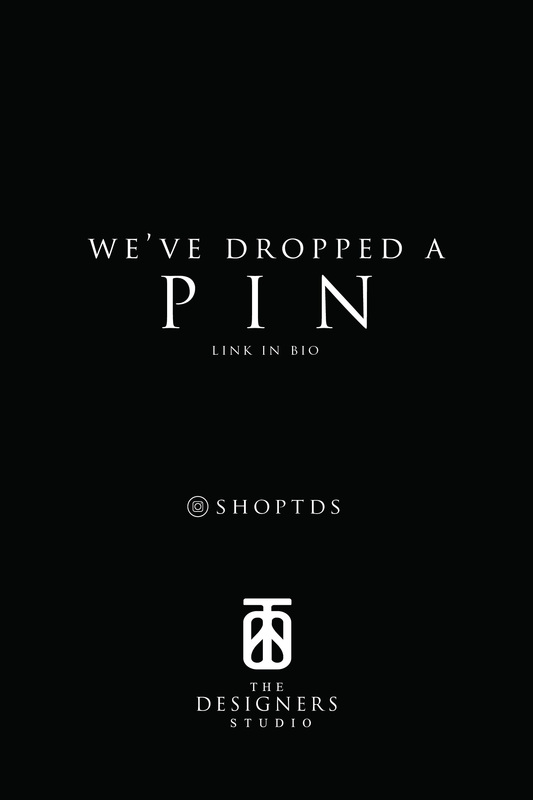 They then buckled-down and worked together to develop concepts, branding, designs and most importantly, iron out the logistics that they’d need to make this label work. Did we mention that the sisters aren’t living in the same slice of the world? Nana and Afua later moved from Germany to New York and London respectively, where Nana became an interpreter and Afua became a banker. They both also studied footwear design and construction in their respective cities. Nana attended the Fashion Institute of Technology in New York while Afua was at the London College of Fashion. 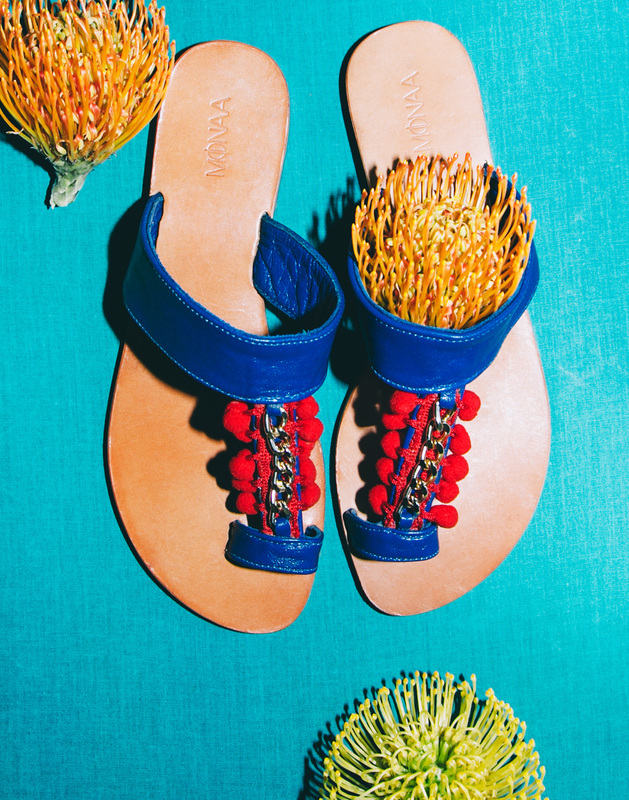 Before MONAA was up and running, Afua had already set up her own footwear label, Mo-Saique. From this experience, she was able to guide the process of founding MONAA. Living in two major cities in the world of fashion, the sisters have the opportunity to take their different experiences and authentically fuse the multiple cultures. For example sourcing fine leather globally that will be combined with African inspired embellishment such as ornaments reminiscent of Adinkra symbols, playful pom-poms and chain detailing. 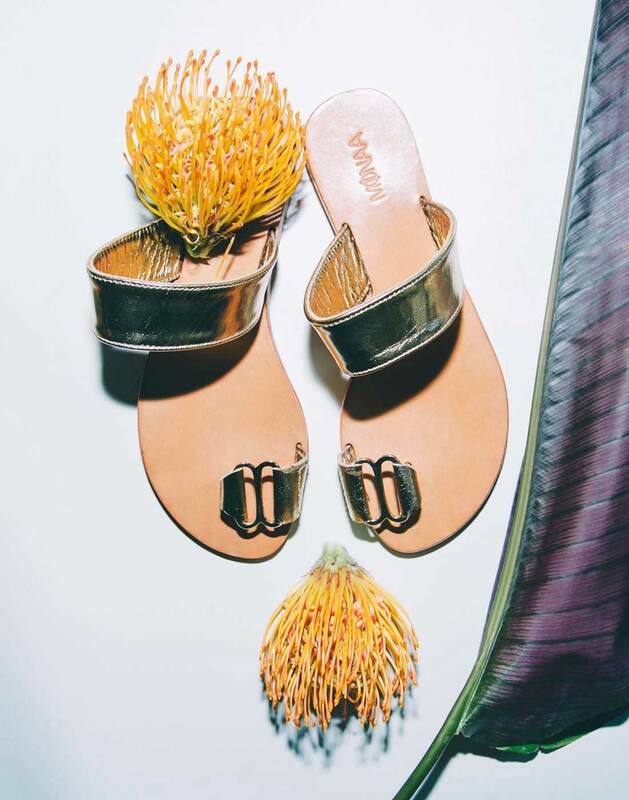 By mashing up tradition and a global perspective, MONAA shoes reflect the designers’ transcontinental sensibility. They also have the ability to design shoes that can support the customer who wants to feel at home anywhere in the world. While their designs are linear and structured, as a nod to European industrial design, traditional elements and inspirations are integral to the overall production. Take for example their take on the Ashanti royal slipper that they named ‘Ahenema’. They took the characteristic sole and streamlined it before incorporating modern colours and print such as cheetah and fuchsia. 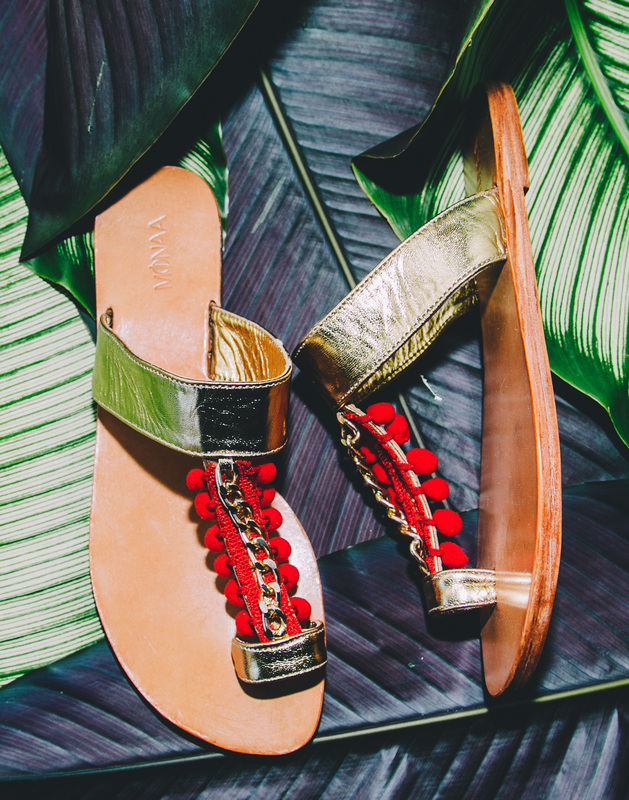 For their ‘Quick Lady’ sandal, they drew inspiration from a Ghanaian traditional board game known as Oware. 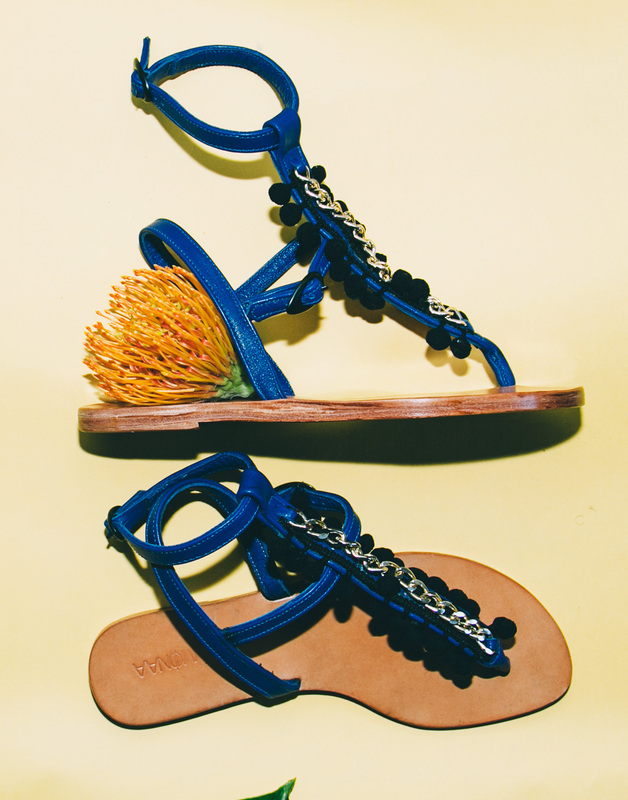 Taking the bonduc seeds, which are used to play the game, they gold-embellished them and incorporated them into the shoe. Entire collections, as well, are influenced by Ghanaian heritage. Their SS15, dubbed ‘The King’s Palace’, was inspired by the palace of Asantehene where the king of the Ashanti resided. As children, they were fascinated with the residence’s interior and decided to draw on elements to inspire the collection. The luxe detail of the palace – from the luxurious rugs and animal skins to the royal umbrellas studded with pom-poms – motivated the collection’s look and feel. While individual essentials gave direction to the embellishments used. For example, imagery of the King’s treasure chests teeming with decadent jewels influenced the decision to use metallic leathers and gold ornaments in this particular collection. Conversely they also draw inspiration from modern times. MONAA, a combination of Afua’s nickname, “Mo” with “Naa”, the affectionate abbreviation of Nana, represents more than just the sisters. 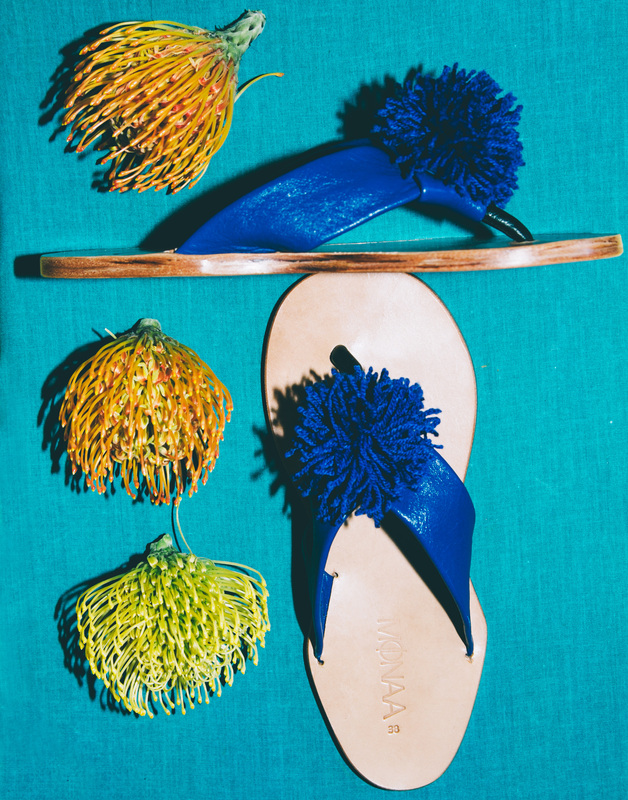 Each of their sandals are handmade by a craftsman whose knowledge is rooted in tradition. Nana and Afua consider the artisans an integral part of the MONAA brand and thus encourage them to be involved in the production process. 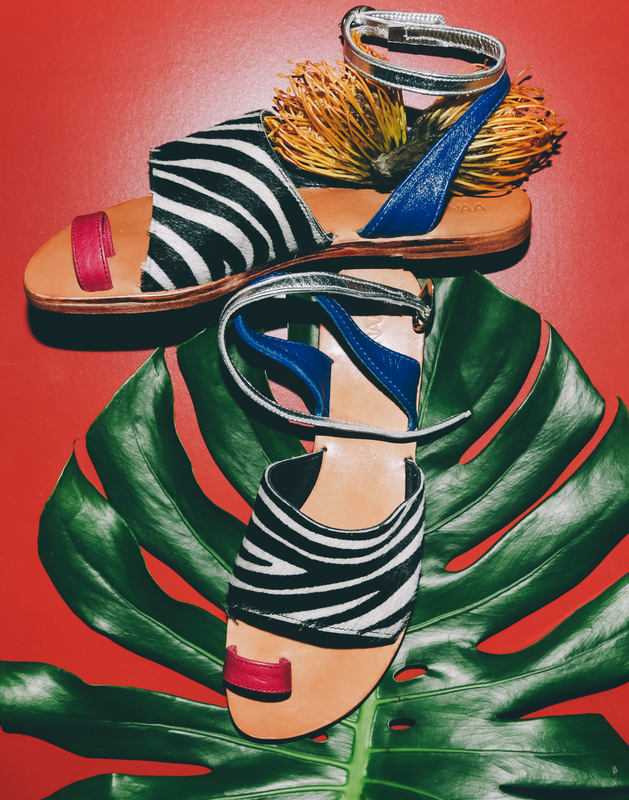 So much so that each sandal is named by the artisans. One pair of Ohenema slippers helped guide the way to creating a label that purveys a small part of their culture with each and every pair. A personal labour of love, Nana and Afua have managed to combine their global perspective with craftsmanship steeped in tradition, to create a stylish ensemble with a feminine aesthetic. Coordinating logistics between three continents can’t be easy, but the outcomes are a ‘Made in Ghana’ product that can easily be at home anywhere in the world.